The Intel Edison board is shipped with the Yocto Linux distribution installed. Yocto allows an experienced developer to compile a small-size Linux image with only the selected packages. Then the image is flashed into the board. It’s not as convenient as Ubuntu as there are no pre-compiled packages that are easy to install. I wanted to add the program mc (Midnight Commander); so, I had to recompile the Yocto image. My computer OS is Linux Ubuntu 14.04. I experienced a few problems while compiling; so, I’ll describe them here. The main document is Board Support Package (BSP) User Guide. I followed it. Downloaded the package Linux source files from the Intel Edison Software Downloads page. At the time of writing, it was in the section Intel Edison® Board Firmware Software Release 2.1. I install everything related to the Intel Edison into the directory /home/farit/edison. The Linux sources consume 11G in that directory. Used the setup.sh script to initialize the build environment for Intel Edison. The compilation took 5 or so hours. I should’ve used the SSD disk. But most files have been downloaded and cached now; so, it doesn’t take much time the second time. Then I decided to compile in Midnight Commander. I checked the name of the package on the Yocto recipes directory. It was “mc”. When there were no errors, I looked in the directory /home/farit/edison/edison-src/build/toFlash. It contained the same files as in the Intel’s firmware image. I ran the command flashall.sh in it as root. I added myself into the group “dialout”; so, I should be able to connect to a USB port as a regular user. I’ll check it again the next time. 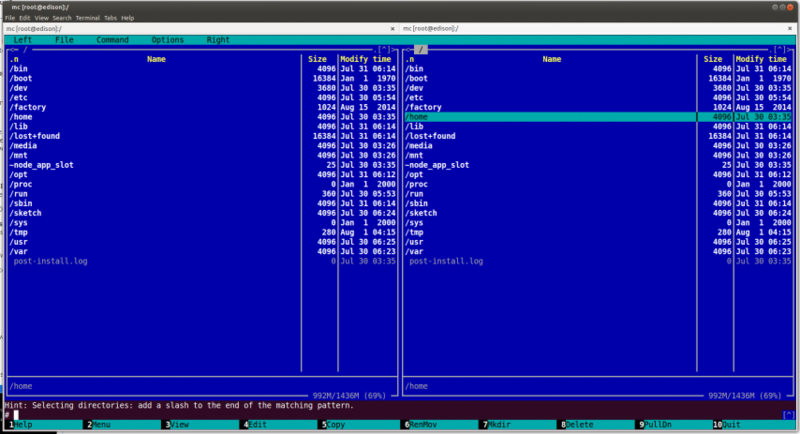 By default, the subshell (Ctrl-O) doesn’t work in Midnight Commander as it requires bash. Change your user shell from the default “/bin/sh” to “/bin/bash” in /etc/passwd.